RFcnn.com, a distinguished supplier of RF connector products, released its new line of SMA RF cables today. RFcnn.com, a well-known manufacturer and supplier of all kinds of RF connector products, has recently released its new SMA RF cables. All the company’s SMA RF cables are offered with great discounts now, up to 32% off. As the sales manager of the company says, RFcnn.com will try its best to keep concentrating on offering premium quality products to customers from poles to poles. "In this promotion, every client will get high quality SMB connectors at a cost they can afford," says the CEO of RFcnn.com. "These cables will offer excellent electrical performance. We aim to attract more customers and expand our global market share. I could see there was no comprehensive SMB connectors that spoke to those involved in the high-end applications, which made it our mission to design such a collection." 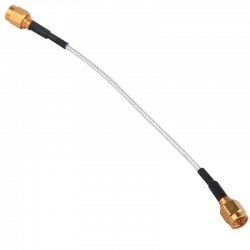 "RFcnn.com is a professional manufacturer of SMA RF cables. The company has faith in this sale for what it offers is ‘factory-direct’ prices. Customers can be assured to get a great bargain." RFcnn.com has an area of 30 hectares with the existing building of 12,000 square meters. It's equipped with the most advanced pieces of equipment and apparatus. All staffs at RFcnn.com are knowledgeable professional and friendly persons. Customers can ask any related questions by phone, message and e-mail. RFcnn.com is an online outlet of Zhenjiang Fourstar Electronics Co. LTD, which is a China based company that aims to provide customers high quality products at the lowest possible prices. Customers can learn more about the company’s products through sample orders with a long-term contract. Most the customers will come back soon after their first deals. More details can be found at http://www.rfcnn.com/SMA-Male-to-Male-Cable-Assembly-Jumper-73.html.